Since my son and I got to go geocaching last week, my wife and I decided that we would try to use our afternoon to find some caches with the whole family. We loaded up several sets of waypoints into the GPSr. We found some near the school and several at nearby parks that the kids like. ﻿We also found a couple containers and bottles that we could use to make our own caches. We got some camouflaged tape and covered up the bottles so they would blend in to their surroundings better. Into each cache we put some paper cut into strips, for logs and the larger bottles got a couple small toys for trade. 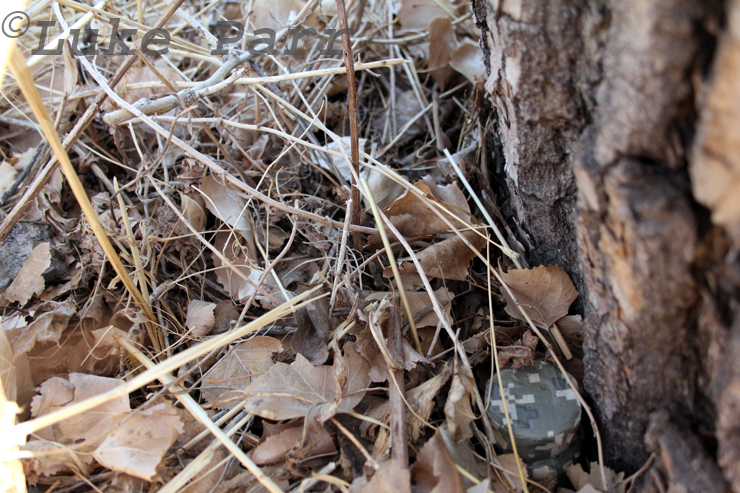 Can you spot the geocache? The first one I hid. We started off at a park, just down the street from the school. It has an old tractor next to the playground for the kids to play on. The kids affectionately know it as the Tractor Park. We decided that this would be a good location for our first cache. The kids played for awhile before we placed the cache. After finding a little over 170 caches, it was nice to finally give back a little and hide something for a change. So after hiding the new cache and marking it with the GPSr, we headed off to find some caches. 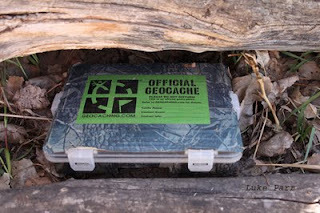 A larger geocache with a label, just in case it is found by accident. We ended up trying for nine caches spread apart through several parks, open spaces and even next to a couple businesses. Most of the caches we found were little micro caches that only contained a log book. Fortunately, we did find a larger cache, pictured at the left. This one had several toys in it and we traded a miniature soccer ball that we had for a little car. We also left the geocoin that I had picked up last week. See the post here. We found all nine caches that we were looking for. We thought one was going to be a Did Not Find (DNF), but after looking hard for about ten minutes, our oldest daughter finally found it. Looking at the size of it, it is pretty obvious why it was so hard to see. It was one of the smallest size microcaches that you can use. You can see below how small it was. When they said micro cache, they weren't kidding. ﻿The kids were tired after the several hour trip. 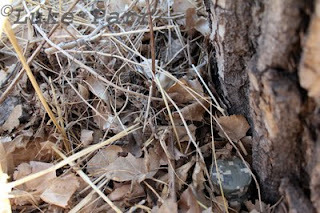 In all we found nine caches and hid the first two of our own. I quickly posted our first two hides, interestingly within a couple hours I received e-mail notifications that they had been published to www.geocaching.com, and then found shortly after. 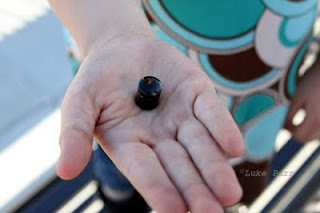 It was another fun day with the kids, any day geocaching and hiking around with the kids is a good day.